The conflict in Vietnam ended 40 years ago, with chaotic scenes in Saigon, now Ho Chi Minh City, as the North Vietnamese Army closed in on the heart of power, its tanks ploughing through the gates of the South Vietnamese presidential palace on 30 April 1975. 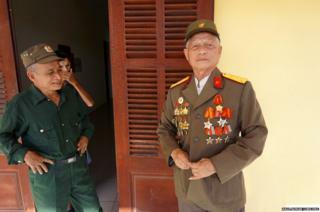 On board one of the tanks was Pham Xuan Do, who is seen in the picture above proudly wearing his uniform from the time. The picture was taken during a project led by Raul Roman, co-founder of UBELONG, and Lonnie Schlein, a former New York Times photojournalist who took a party of 14 people to Vietnam in May, with the aim of capturing the stories of those who fought for the North Vietnamese Army (NVA) or Viet Cong. Do served in the NVA as a lieutenant captain from 1965 to 1975. He said he misses some of the excitement of war, but now that time has passed feels "forgiveness". The projects aim is to see the war from the perspective of North Vietnamese veterans, and to mark 20 years since the then US President Bill Clinton normalised diplomatic relations between the two countries, on 11 July 1995. "It's really important work because the world needs to be reminded that the dark shadow of the Vietnam War still looms large in this country," says Mr Roman. "This work is really special also because it's an international civic initiative by ordinary citizens, a sort of peace mission designed to bring people together." The group conducted more than two dozen in-depth interviews with veterans, travelling to Hanoi and rural locations bombed during the war. Many of these areas were subjected to use of the toxic chemical Agent Orange, a defoliant sprayed over jungle areas to destroy enemy cover. Vietnam says several million people have been affected by Agent Orange, including 150,000 children with severe birth defects. Here are a selection of the stories they uncovered. Pham An Thic (left) served in an artillery unit from 1965 to 1977 and was the only son in his family who survived the war. His mother, Dau (right), now almost blind, remembers receiving the letters from the government announcing that her other four sons had been killed. "I didn't know how they had died," she said. "I didn't know what they were doing when they died. I just knew that they were gone. Losing a child is the greatest sadness." Thic's wife (centre) waited for him for 12 years. "I did not know if he was dead or if he was alive," she said. "All I could do was to take care of my children and work hard so I could feed them. "I wasn't special. I was one of thousands of Vietnamese wives and mothers who had to survive without their husbands during the war." She recalls the day her husband returned. She was working in the rice fields when one of their neighbours gave her the news. "I ran all the way home," she said. Tran Thi Thon served in the North Vietnamese army from 1965 to 1975, delivering supplies from the North to the South. "The day I remember most vividly was the day we found a downed American pilot.," she said. "I saw that he had lost his shoe, so I took my shoe off and strapped it on his foot. "Then, I took my handkerchief out and wiped the blood off his face. "I felt very sympathetic because he was just another human and he didn't want to be in this war just like I didn't. "The pilot then told my crew to hide, as a rescue helicopter was on its way and they would shoot us. "But the helicopter never came and the pilot was captured by our soldiers." While making her deliveries, she saw a yellow liquid covering the jungle. It felt cool to the touch, so she and her teammates picked leaves and rubbed the substance on their skin to refresh themselves. It was Agent Orange. Now, the skin on her arms, legs, and stomach is covered in scars. She underwent several operations to repair the damage. Luong Ngoc Lam was photographed at Friendship Village, a shelter for veterans and children affected by Agent Orange. He served as a field soldier for the NVA from 1966 to 1975. His proudest moment was participating in the taking of Saigon. "When the war ended, I had not seen my wife in 10 years," he said. "I returned home to learn that she had held 10 funerals during that period, including one for my younger brother. Luong Duc Pho was a driver, transporting soldiers in his jeep as well as rebuilding and clearing roads to facilitate the transportation of weapons and food. Pho waited 15 years to recover the body of his brother killed in the war. "The young generation doesn't know anything about the hardships of war," he said. "They have never been through this. They don't know what being hungry means. Tran Van Van and his wife, Pham Thi Sang, are pictured at their home in Binh Giang. Van served in the North Vietnamese Army from 1965 to 1972 and was stationed on the border of Cambodia on the Ho Chi Minh trail, tasked with protecting the road from bombers. "We were bombed so often, and so many people died on the battlefield," he said. "The badly injured were taken to the aid station, but I buried my dead friends on the battlefield. I miss them greatly." He was eventually discharged after being injured in a bombing. He often relives that event in his nightmares. While Van was fighting, his wife worked as a rice farmer in order for the family to survive. "We were very poor and always hungry because there wasn't enough rice for me and my babies," she said. "One of the hardest moments of my life was when I had to go into the fields after my baby was born, but I had no choice. "I didn't want to tell Van so I wrote him letters of encouragement to stay and fight in the war. Our country was more important." During the seven years in the army, Van only saw his family once, for a 10-day span in 1968. Vu Thanh Lan fought with the Viet Cong in Quang Nam and Quang Ngai for more than a decade. Nguyen Van Vuong started as a soldier in the North Vietnamese Army in 1966 and ended his service in 1971 after contracting malaria. In the battle of Quang Tri, during the Tet Offensive in 1968, his unit of 100 men was devastated. He was one of 20 who survived. Later, he lost most of his hearing during a bombing raid. Returning home after the war was not easy. "My village was destroyed and government assistance couldn't support me," he said. Tran Van Thinh joined up aged 19 and ended his service with a high rank and multiple medals of honour. In the battle of Quang Tri in 1968 he was hit by a bomb that blew off part of his left arm and shattered his right leg. Married for 30 years with one son and two grandchildren, he lost two brothers in the war. "I was very young. All I knew at that time was that I had to fight the Americans to reunify my country," he said. For those in the UK Storyville: Last Days of Vietnam can be seen on BBC 4 at 22:00 on Monday 13 July 2015.